One of the Roofing Styles with the greatest Longevity is Slate Roofing! Slate is a natural rock cut and shaped specifically for Roofing! Typically a Slate Roof can last anywhere from about 80 years to 100 years! Slate Shingles have a low water absorption rate, and they do phenomenally well in Freezing Temperatures! Due to the Sturdiness of Slate Shingles, it isn't as easily damaged in Stormy Conditions! One of the Cons of using Slate Shingling is the difficulty level of repairs when repairs are needed. When you are dealing with Slate Shingling Repairs, a Specialist is a Necessity! It can be very difficult to find a Slate Roofing Specialist! However, when you use Rockwall Metal Roofing, we happen to specialize in this particular kind of Roofing and the Repair Process! Slate Shingles might not be what your roof needs. Due to the Sturdiness of the Slate Shingles, they tend to be heavier. Some structures are not suited for Slate Shingles. Call us NOW and we can come take a look and make sure that your Structure is Suitable for Slate Shingles! We offer NO Obligation, FREE Estimates. So even if you don't use us, we can still determine if your Structure is Suitable or not! Not sure if Slate Shingling is suited for your particular Roofing Style Taste? 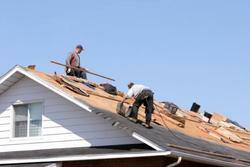 Give us a Call and our Roofing Specialists can discuss this particular Roofing Style with you! We are eager and waiting to serve YOU!